May Report: Samsung OLED Fabs, Micro LED, Touch Panel for Vertical Market - Touch Display Research, Inc.
Santa Clara, California, May 18, 2017—In the recently published “Touch and Emerging Display Monthly Report,” Touch Display Research Inc., a market research and consulting firm, analyzes Samsung’s OLED fabs, micro LED, quantum dot, Active pen, smart mirrors and touch panels. 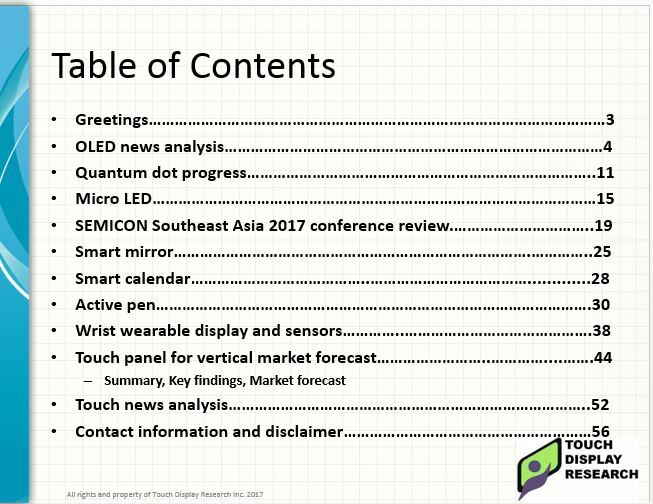 “I just returned from the SEMICON Southeast Asia 2017 conference hosted by SEMI Southeast Asia, at the beautiful Penang, Malaysia. It was my honor to meet some of you in person. We have a brief review of this conference in this report. Micro LED has attracted more investment. The adoption of touch screen in the vertical market will continue to increase rapidly. 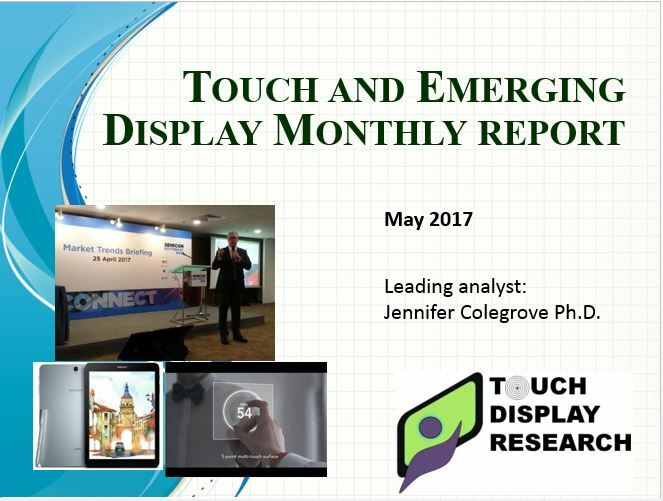 These hot topics are analyzed in this report,” said Dr. Jennifer Colegrove, CEO and Principal Analyst of Touch Display Research Inc., who has authored reports on the touch panel and emerging display industry for over ten years. The May 2017 report is available immediately.